Ruby Pearl Henshaw1,2,3 [Pearl R. Henshaw4]. Henshaw, Ruby Pearl, niece, age 8, born in Iowa; father born in Illinois. 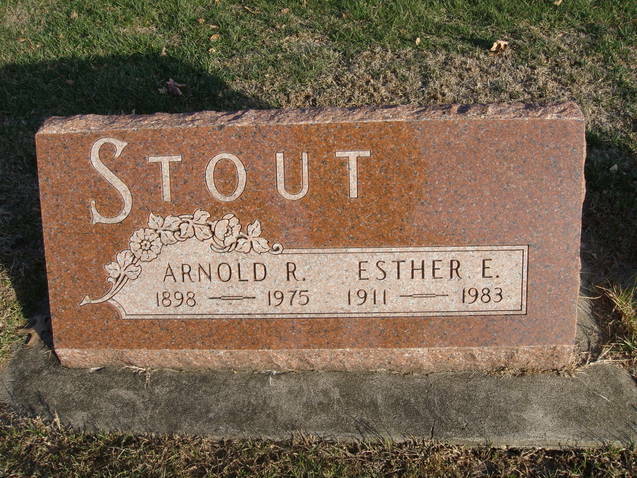 Stout, Arnold R., head-of-household, age 20, born in Kentucky; parents born in Kentucky; rented home; occupation: auto driver, hardware co.
Stout, Pearl R., wife, age 18, born in Iowa; parents born in Iowa. Stout, Arnold R., lodger, age 31, born in Kentucky; parents born in Kentucky; married; rented home; occupation: laborer, horse market; not a war veteran. Stout, Snoda, lodger, age 27, born in Illinois; father born in Illinois; mother born in Missouri; married, first married at age 16. Stout, Eugene, ward, age 3 years 10 months, born in Illinois; parents born in Illinois [sic]. Rapp, George A., head-of-household, age 46, born in Illinois; completed 4 years of high school; on Apr 1 1935 was living in the same house; owned home ($8000 value); occupation: general insurance agent, own business. Rapp, Vera S., wife, age 43, born in Illinois; completed 3 years of college; on Apr 1 1935 was living in the same house. Rapp, Gena A, son, age 13, born in Illinois; completed 7th grade; on Apr 1 1935 was living in the same house; attended school. Senn, John C., brother-in-law, age 31, born in Illinois; completed 4 years of college; on Apr 1 1935 was living in the same house; single; occupation: insurance agent & salesman, insurance co.; worked 52 weeks in 1939; $1200 wages in 1939. Iowa, Births and Christenings Index, 1800-1999; http://www.ancestry.com. 1910 census, Clayton Township, Taylor County, Iowa; roll T624-425, ED 129, page 31B, line #51, dwelling #15, family #15. 1920 census, 1st Ward, Galesburg, Knox County, Illinois; roll T625-380, ED 157, page 1B, line #99. Contribution from Gene A. Rapp. 1900 census, Fern Creek Precinct, Jefferson County, Kentucky; roll T623-533, ED 149, page 6A, line #14, dwelling #112, family #115. 1910 census, 314 23rd, 12th Ward, Louisville, Jefferson County, Kentucky; roll T624-387, ED 206, page 10B, line #80, dwelling #195, family #211. Ancestry Family Tree data "DANIEL F. JOHNSON FAMILY TREE (1806-2010)" posted by "DaughterofDAR". 1930 census, 1st Ward, Galesburg, Knox County, Illinois; roll T626-527, ED 14, page 6B, line #89, dwelling #116, family #134. 1930 census, 2nd Ward, Galesburg, Knox County, Illinois; roll T626-527, ED 15, page 14A, line #27, dwelling #250, family #399. 1940 census, Naperville, DuPage County, Illinois; roll T627-797, ED 22-49, page 2A, line #18, household #29.